Over the past few years, there has been an explosion in awareness like never seen before. Worldviews have shifted dramatically and key issues have come into the spotlight which would have never met such a great audience just a decade ago, such as sustainable agriculture, contaminants in vaccines and in the water supply, and mass surveillance. Many people have abandoned the idea of partisan politics and the media which supports it. Thanks to the internet a people’s media emerged and started to clear the air of the lies and deceptions that the old media had been plagued with. However, as this last election came to a close, the perspective shifted and took us a few paces backwards in many respects. Incidentally, the focus was placed on Trump rather than the issues which were being fought so hard throughout the Obama and Bush administrations. Once again, the debate has become about the integrity of those in power instead of actual real world issues that affect everyone. Whatever you believe Trump’s motives are, it’s important that we don’t get so caught up in arguing over something we have no control over that progress made on real issues is lost. What the country needs right now is a massive healing, and I think the best way of doing that is to learn how to set minor differences aside and work together to solve our problems, instead of looking to government to solve them for us. Whether you’re left, right, something in between or nothing at all, you can always become more informed and act to make a difference in the world we live in. That’s why I’ve put together a list of 5 problems which desperately need fixing and can be solved without government if enough people work together to achieve a solution. According to the U.S. Energy Information Administration (EIA), the world’s supply of liquid oils such as petroleum can only meet our needs until around the year 2040. If this is to be believed, it should be concerning to anyone who plans on living for more than 20 years or so into the future. In addition to the fuel we need to power our cars, everything from credit cards, house paints, cameras, and more are created using petroleum. However, this could all be a blessing in disguise if it urges us to move toward alternative forms of energy such as solar, hydro, or even more exotic technologies which are still in their infancy. If people worked together to bring these renewable energy sources into their communities, not only would we increase our independence from big oil, but individuals would be much more self-sufficient and prosperous. It’s no secret that corporations like Monsanto are poisoning our bodies, but the switch to mass-produced, agrochemical dependent agriculture and genetically modified foods has been a slow disaster for the environment and our health, it also threatens our food sovereignty. Many people are unaware that Monsanto, the company which produces several chemical pesticides and herbicides, such as Round-Up, and engineers most corn and soy produced in the U.S., also has an extensive century-long history of corruption. From mass-producing the worlds first toxic chemical sweetener known as saccharin, to hiding the evidence of PCB toxicity, there legacy is disturbing. Unfortunately, instead of being held accountable, they’ve been granted the power to genetically engineer crops and place patents on the transformed genomes, effectively restricting anyone from growing genetically modified crops themselves without first obtaining a license. Consequently, through a combination of cross-pollination, crops which don’t produce seeds, pollinators dying off and more, Monsanto and other biotechnology corporations are creating a monopoly over food production making it increasingly tough to grow even a simple garden without obtaining a license first, all the while forcing us to eat food which has been heavily doused with toxic chemicals. But none of this has to be. If people come together to reject GMO’s while defending local and organic agriculture, we can retain food sovereignty, strengthen relationships through community gardening, and eliminate many toxins which are causing so much death and disease. Something most people don’t want to think about is the fact that the Federal Reserve bank of the United States, a private bank which came into being through a collaboration of powerful business interests, including the Rockefeller and Morgan empires, has unlimited power to print money, unaudited. Using this power, in conjunction with the ability to lower or raise interest rates at will, the bankers at the Federal Reserve are in a powerful position over the government of the United States. By using a system of debt-based currency, the central bankers are able to create an economy which ultimately directs real wealth back to them while leaving the people with less than a fraction of what they’ve earned. This system of fiat currency inevitably ends in a collapse of the money supply because of a need for ever-increasing levels of the currency to pay off the debt attached to each dollar printed. Our founding fathers understood this, but in 1913, the same year the Federal Reserve was created, the constitution was amended to allow for the printing of debt-based fiat currency. Learning about this issue and spreading awareness can help oust the bankers by garnering support for movements against the central banks like the Audit The Fed bill introduced several times by Senator Rand Paul and former Congressman Ron Paul. The following films offer a more in depth look at this issue: The Collapse Of The American Dream (an animation on the creation of the federal reserve) and The Biggest Scam In The History Of Mankind. By now most are aware that almost all major media outlets are owned by a handful of corporate conglomerates. The current number is 6, but several of these parent companies have been attempting to merge which could reduce the number to three or four in time. Currently Fox News is owned by Rupert Murdoch’s News Corp along with the Wall Street Journal; MSNBC is owned by Comcast along with NBC and so on. Outlets like PBS and NPR are funded partially by the government itself and partially by people like Bill Gates. This is why you will never see an unbiased view on issues like taxation or vaccines from places like these. Just spend five minutes watching the commercials on mainstream news shows and you’re bound to see ads for pharmaceutical/vaccine companies, GMO food brands, weapons manufacturers, and more. At some point you have to come to terms with the fact that the majority of what you see and hear ultimately comes from just a few sources – maybe even one. Now, no reasonable person would think that they have anything resembling an impartial view by only listening to one or two sources of information and perspective all the time. That only leaves you with what one group wants you to know. The only way to reasonably understand something is to seek out information that you don’t already agree with and be open-minded about it. You won’t agree with everything you hear, but at least you’ll be listening to as many sides of the story as possible before making up your mind. The best way to combat this issue is to support the independent media. The most likely place that you’re going to find truthful information on a consistent basis is not from big name news companies like Fox News or the New York Times, but from smaller media outlets with a strong code of ethics which are willing to diverge from the status quo. Clearly being engulfed in partisan politics is not getting us anywhere. We’re going to have to start listening to each other again and break the political molds in order the start caring about real issues again. This article (5 Issues to Unify Us in the Divide and Conquer Era of Trump) was originally created and published by Waking Times and is published here under a Creative Commons license with attribution to Phillip Schneider and WakingTimes.com. It may be re-posted freely with proper attribution, author bio, and this copyright statement. The following was originally published on Awaken the Dream. Every now and then an event happens in our world that captures my imagination, touching something really deep within me. The Native American protests against the Dakota Access Pipeline (DAPL) at Standing Rock, North Dakota is just such an event. This has the feeling of a truly seminal, historic event in which we are all invited to participate. The peaceful protests by what are known as the “water protectors” against a multi-billion dollar corporation putting an oil pipeline through what the Native Americans consider sacred land, endangering the source of their water—i.e., of life itself—is a deeply symbolic event with real life consequences. In a very real sense, the protest is itself a sacred ceremony being performed on the world stage, being done on behalf of all of humanity – which is to say, all of us. As if a formless archetypal process is taking on form and materializing in front of our eyes, a deeper universal conflict that exists within the unconscious psyche of humanity is becoming visible at Standing Rock. At these protests there is a meeting—a confrontation—of two opposite edges of the universe, an encounter of two completely polarized world-views and ways of life. On the one hand, there is the indigenous perspective that honors all life, living in conscious relationship with the earth. 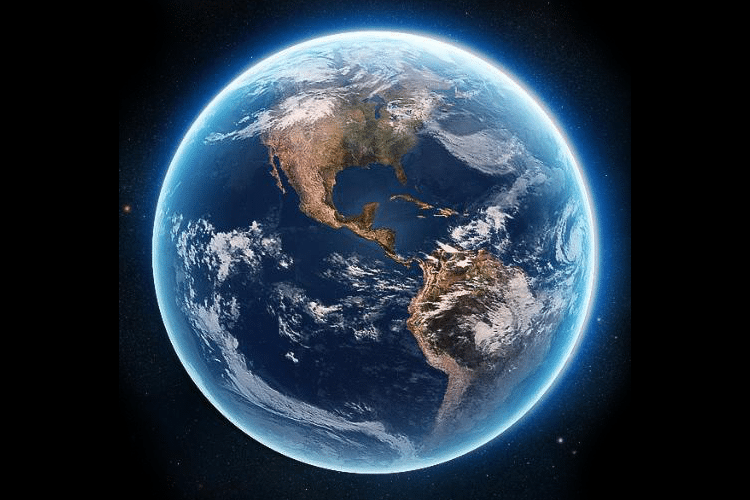 On the other hand is industrial civilization, which sees the earth as some “thing”—an inanimate object—to be used for profit, a perspective which is actually destroying the biosphere, the very life support system of the planet. Two more opposed world-views are hard to imagine. At Standing Rock, a dissociation and fragmentation that exists deep within the soul of humanity is, both literally and symbolically, playing out on the world stage. Seen symbolically, the image of this primordial conflict is quite striking: The “weapons” of the indigenous perspective are love, compassion, prayer, ceremony and truth. The weapons of industrial civilization are guns, clubs, pepper spray, mace, tear gas, tasers, attack dogs and the like. By viewing what is taking place in this conflict symbolically, something profoundly important is being revealed to us that has to do with all of us. Symbols are the language of dreams, which is to say that symbols reflect something within the dreamer, which in this case is us. Once we recognize—as if looking in a mirror—the reflective nature of what is symbolically playing out, a potential doorway opens in our minds. What is playing out at Standing Rock is all of our business. The conflict at Standing Rock is an iteration of a seemingly endless fractal that is happening in different guises not only all over the world, but all throughout history as well. It is the current re-creation of the countless scenarios where those in power abuse their power over the less powerful (often taking their land and resources).The pipeline was originally going to be close to the city of Bismarck, until there was pushback from the city’s (mostly white) population, who were understandably scared of the inevitable leakage from the pipeline contaminating their water; it was then re-routed to its present location.For the Native American people, it is a modern-day repetition of the original trauma of when the Europeans came over and not only forcibly took over their land, but committed racial and cultural genocide. In bulldozing the Native American’s sacred burial grounds, it is as if the indigenous blood that was spilled across this continent by the US Cavalry—cloaked under the charade of “discovery”—is awakening the spirits of the native ancestors, who were slaughtered mercilessly in the name of “Manifest Destiny.” Animated by this sacred spirit, at Standing Rock the Native Americans are courageously fighting the same demonic force that has for centuries ravaged their people, lands, and sacred heritage. How we look at things determines what we see. How we view the conflict at Standing Rock depends upon how far back we go in time, i.e., where we start in the story. The argument of Big Oil is that the protesters are trespassing on private property, i.e., breaking the law. But way back when, this land was the Native Americans’ land (it didn’t “belong” to them, any more than the sun and the sky belonged to them – they simply lived there). Their land was then forcibly—violently—taken from them by our European ancestors. At a certain point the US Government gave back to the Native Americans the very land that’s in question in a treaty. Later, whenever many of these treaties became “inconvenient” (i.e., stood in the way of private profiteering), the government broke their promises (illegally, I might add) by simply ignoring them, pretending as if they never existed. And now Big Oil, backed by a militarized response from both our government and private contractors, is fabricating a false collective narrative that the Native Americans—who, let us not forget, are living on land stolen from them—are the ones who are breaking the law. This is totally upside-down crazy – a reflection of a madness that afflicts industrial civilization world-wide. To say that this madness borders on being criminal is an understatement – it IS nothing other than criminal. Those aligned with and taken over by the Black Snake – i.e., wendigo/wetiko endlessly “consume,” like an insatiable cannibal, the life force of others—human and nonhuman—for private purpose or profit, without giving back anything of value from their own lives. At the collective level, this perverse inner process is mirrored by the consumer society in which we live, a culture that continually fans the flames of never-ending desires, conditioning us to always want more. As if starving, we are in an endless feeding frenzy, trying to fill a bottomless void. This process of rabid, obsessive-compulsive consumption is a reflection of a deep, inner shared sense of spiritual starvation that is endemic to industrial civilization. To quote Native American scholar Jack Forbes, “This disease, this wetiko (cannibal) psychosis, is the greatest epidemic sickness known to man.” Wetiko is a collective psychosis that can be likened to a virus of the psyche that deranges our mind, thereby giving us the wrong orientation towards life and what is truly important. A true case of moral insanity, wetiko is the root cause of humanity’s inhumanity to itself, of the self-and-other destruction that our species is acting out all over the world. Wetiko disease is a self-devouring operating system, a living death sentence that, if left unchecked, destroys everything within its dominion, including itself. It is significant when a deeper, mythic archetypal process becomes embodied and acted out (i.e., “dreamed up”) like it is at Standing Rock, for this is an expression that this heretofore unconscious process is emerging into consciousness so as to be potentially integrated. Seen symbolically, the deeper archetypal—and primordial—process of good vs. evil is getting played out at Standing Rock. To give a sense of the evil we are up against, the company constructing the pipeline—Energy Transfer Partners—exploiting the chaos of the recent Presidential election as a distraction, announced on Election Day that it would defy President Obama’s request to stand down and would begin the drilling of the most contentious portion of the pipeline in just two weeks. 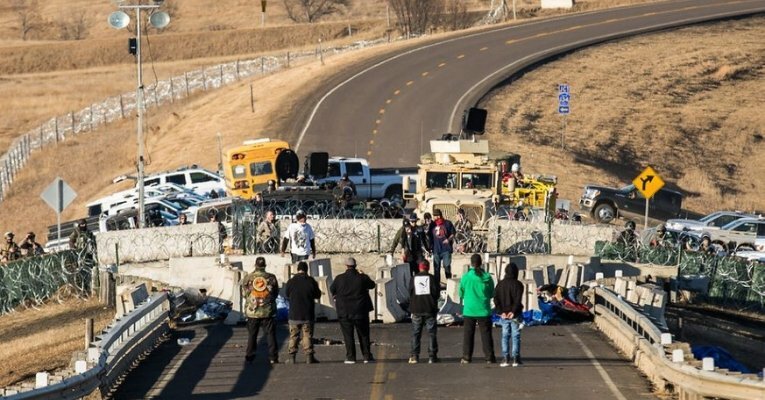 Splitting the world into good and evil (and being identified with the good) is a slippery slope, oftentimes quite dangerous (as many millions of innocent people have been killed as a result of this process), but if there was ever a situation that lends itself to clear-cut good vs. evil, Standing Rock is it. A war between life and death is, both literally and symbolically, playing out at Standing Rock. When the opposites appear in bold relief like this, it is an expression that something “beyond the opposites” is beginning to emerge into view – we should be on the lookout for this. This is to say that encoded in the conflict is a potential blessing, just like hidden within a poison is its own medicine. On the one hand there is the fossil fuel industry—“Big Oil”—backed by, and in collusion with our legal system, the police and the government. Because of its power, Big Oil has managed to have public funds being used to protect its very private interests (i.e., its profits); this is to say that taxpayers are footing the bill on behalf of the super-wealthy. Add to this mix the mainstream media (the propaganda organ of the prevailing powers-that-be), which, when it is not putting out disinformation about what is taking place, is barely covering what is happening—some independent journalists have been violently brutalized and even arrested as they report on the protests. Due to the mainstream news blackout, we are being left “in the dark” – which is to say that many people aren’t even aware of what’s taking place at Standing Rock. This is by design, for as more people find out about the evil that is being perpetrated in their name, the more power becomes available to us – the people. Only in coming together can people and communities create the conditions for the regeneration of life and overcome the very powerful forces that would extract the last barrel of oil from the earth. In this case, knowledge is truly power – this is why the powers-that-be, and the mainstream media they control, are heavily invested in keeping us in the dark. The seeming entity that enlivens, sponsors and supplies cover for this sinister project is what the Native American wisdom holders are pointing at when they use the word wetiko. The Bible refers to one aspect of the multi-faceted wetiko pathogen as Mammon(the god, or demon, of the love of money), and it makes the point that we can’t serve two masters; we either serve God (and the good) or Mammon. Those who serve Mammon are driven by nothing other than power, control, greed and money—truly the powers of darkness. As if something is riding them, they are taken over by something other than themselves – they aren’t able to help themselves in the compulsive acting out of their money-lust. The incredible destruction that they cause, be it of the environment, communities or the lives of individual human beings, are considered to be nothing more than collateral damage, merely the price of doing business. Human beings are “objectified,” either seen as pawns, obstacles, commodities or consumers. One of the ways wetiko takes on corporeal embodied form is by incorporating itself through multinational corporations like Big Oil (which, like a multi-headed hydra, is only one of wetiko’s appendages). These multinational corporations have ever-increasing influence over governments worldwide, which serves to further wetiko’s propagation. Like a Frankenstein monster, as wetiko entrenches itself in our global system of doing business, it practically assumes an autonomous life and will of its own. This sinister life-form feeds on life and the living, as if it is a form of death taking on life. Endlessly draining the earth’s resources, the vampiric wetiko entity is, like an addict, only interested in its next fix. It is solely concerned with short-term profits, having little or no meta-awareness of, or concern for, the deleterious long-term effects of its rapacious actions. And yet, in its full-bodied incarnation at Standing Rock, the formless entity of wetiko is revealing itself, which is to say that what is playing out at Standing Rock is a symbolic out-picturing—a living flesh and blood revelation of something within us—that is crucially important for us to bring into consciousness. Standing Rock is a looking-glass, helping us to get into focus and see—in a case where the micro mirrors the macro and vice versa—that wetiko is not just a localized phenomenon appearing solely in North Dakota, but is informing the evil that is playing out all over the world. Because wetiko acts itself out through our unconscious blind-spots, the way to dispel wetiko’s pernicious effects is to see it, to bring consciousness to how it operates both out in the world (via our unconscious collusion) as well as within our own mind (please see my book Dispelling Wetiko: Breaking the Curse of Evil). On the other hand are the Native American people who have been oppressed for so long and are finally saying “enough, no more,” as they stand up to their oppressors. More than three hundred Native American tribes have come together and are on the ground at Standing Rock standing as one, which itself is unprecedented, as some of these tribes have been enemies from time immemorial. Stepping out of the illusion of being powerless, these tribes are recognizing the incredible power that becomes available when we see through the illusion of our being separate from each other, and in the spirit of peace, come together in solidarity and join forces – this itself can serve as a mirror and inspiration for all the rest of us. Waking up to our intrinsic power as we stand together as one is the powers-that-be’s worst nightmare. In their sacred activism, the Native American protestors consider themselves to be the guardians and protectors of the water, of the land, of the earth as a whole system. This is a job that we shouldn’t out-source to indigenous people: we are all the custodians of the earth—protectors of life itself—which bears with it a great responsibility. There is no greater honor. We are all in this together. Let us hear the call of the indigenous soul within us and spread the word about Standing Rock. AZTEC — Shirley “Sug” McNall says the San Juan Basin can be an outdoors paradise for visitors. But for those who live here and breathe the air, she says, it’s just plain hell. McNall, 69, is a member of an ad hoc environmentalist group — with friends Tweeti Blancett, Jan Rees and Kris Dixon — called the Four Grans. The four Aztec grandmothers, who met at a clean-air conference more than a decade ago, work toward improving San Juan County’s air quality. For eight years, McNall has taken people on tours of the area in her small, sky-blue pickup truck, its tailgate plastered with progressive bumper stickers that stand out in Republican-dominated San Juan County. Her tour skips popular stops like Aztec Ruins or Quality Waters in favor of gas pads and waste disposal sites she says are guilty of polluting the air with noxious chemicals. What McNall calls the “Toxic Tour of Hell,” began in 2005 after she attended a summit on oil and gas industry accountability in Farmington. She started with seven sites around the county she says are polluting. “The summit brought together scientists, tribes, officials, and they wanted to actually see the sites they were hearing about, and I said I’d show them,” she said. McNall’s family homesteaded more than 700 acres in the Crouch Mesa area and moved to her home off of Navajo Dam Road near Tiger Park in 1976. In the years she has lived there with her husband, Warren, McNall says she has seen wells pop up around her property. In 2010, McNall and a group of friends formed the San Juan Bucket Brigade, a local program of Global Community Monitor, a nonprofit human rights organization, to take air quality samples at three oil and gas facilities in the county. McNall said all three came back with elevated levels of carcinogens that are above what the Environmental Protection Agency recommends. San Juan County Operations Officer Mike Stark argues air quality in the area is cleaner than in the past and is showing signs of improving even more with the planned unit reductions at two major power plants, Four Corners Power Plant and San Juan Generating Station, both near Farmington. McNall said she understands the need for energy. Born and raised in the area, her grandparents, uncles and first husband worked in the oil patch. Despite that, McNall says she is enraged refineries can get away with emitting carcinogens and chemicals that pollute the air and do so in close proximity to neighborhoods. The latest addition to her tour, stop No. 8, is a well site near McCoy Elementary School’s playground along Martinez Lane. McNall added the well site, owned by XTO Energy Inc., a subsidiary of ExxonMobil, early last month when her friend, former City Commissioner Jack Scott, drove by the school and smelled gas fumes. “Warren and I got a call from Jack telling us that the gas pad was stinkin’ something fierce, despite their car’s windows rolled up when they drove by,” McNall said. She said she quickly wrote to Aztec Municipal School District Superintendent Kirk Carpenter, Aztec City Manager Josh Ray and Brandon Powell, a field inspector with the Aztec division office of the Environment Department’s Oil Conservation Division. Emily Snooks, a spokeswoman for XTO Energy, said no leak occurred at the well site. Inspections of the company’s well sites by an XTO Energy Lease Operator are conducted approximately every other day, Snooks wrote in an email. Snooks said XTO staff reviewed several days of automated reports at the well and did not find a loss of gas volume or pressure, which would have indicated a leak. “The XTO employee noticed a manual water dump valve on the separator was not as pliable as a new valve would be so just as a precaution, it was replaced,” Snooks wrote. San Juan County Commissioner Scott Eckstein, whose district includes Aztec and Bloomfield, said that in his eight years of service he has only received about four or five complaints over air pollution. An air quality index report for San Juan County on the Environmental Protection Agency’s website gives the county a “good” rating, with pollution in the air posing no threat to human health. Despite that, McNall is adamant more should be done to regulate the county’s oil and gas industry to ensure a clean and safe county for its residents, present and future.